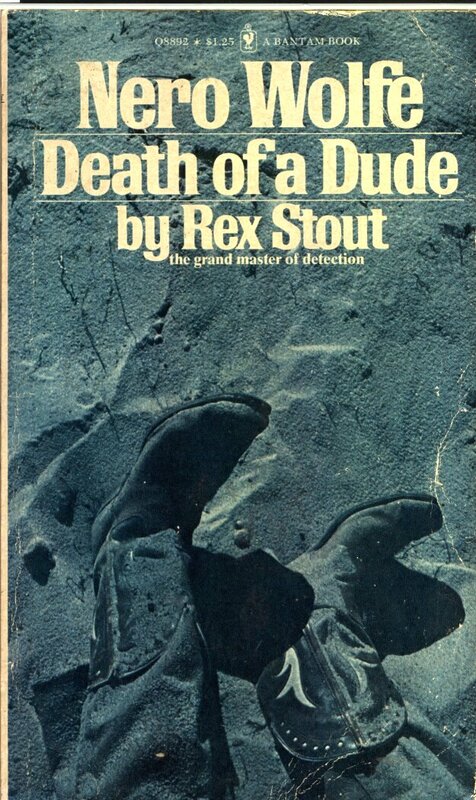 …and never the twain shall meet, or so orchid-growing, gourmet detective Nero Wolfe thought. That was, until he found himself on a dude ranch in Montana dealing with all sorts of un-Wolfean situations … like chairs too small for his bulk, belligerent sheriffs, uncooperative cowboys and unwed mothers. This cover is from Traffic Jam AKA Heidi Marsh. 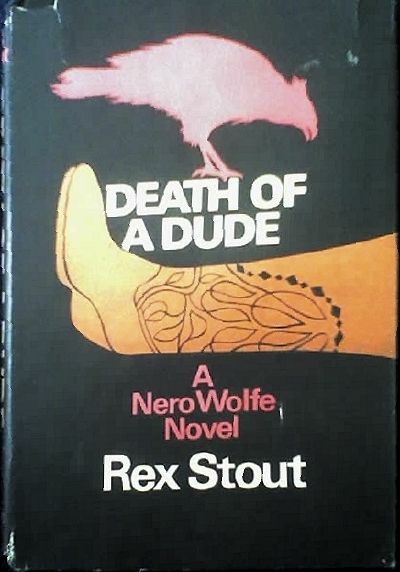 So you think you know Nero Wolfe, do you? So you’re reasonably sure that only the most dire emergency will induce Nero to leave his home on West Thirty-fifth Street, and that no case since his early days could make him budge from Manhattan Island or miss a meal cooked by his own precious Fritz? Well, brace yourself! 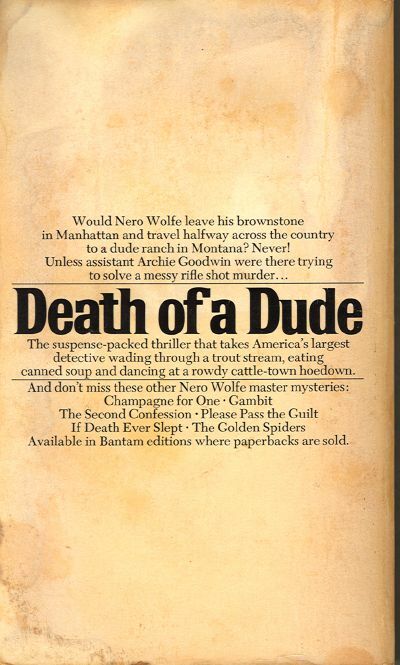 In this latest full-length Nero Wolfe adventure, Nero not only leaves house, cook, and orchid plants, but also flies nearly cross-continent to Montana to join Archie Goodwin on a lavish but very private dude ranch. Here he settles down to solve a murder by rifle shot, resigned to the necessity of performing such unWolfean activities as tramping through underbrush, wading in an icy trout stream, eating canned soup, and attending a rowdy Saturday night hoedown in a cattle town. He also has to deal with a young unmarried mother, some uncooperative cowhands, a highly belligerent sheriff, an off-Broadway actress, and any number of chairs which don’t begin to fit his bulk. Yet, throughout, he remains the same inimitable Nero Wolfe. 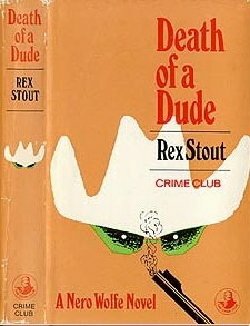 How does Rex Stout know enough about the Far West to write this novel? Every summer, for a large part of his life, he spent his time riding pack trains, fishing mile-high streams, and enjoying night after night around campfires, yarning with genuine cowpunchers. 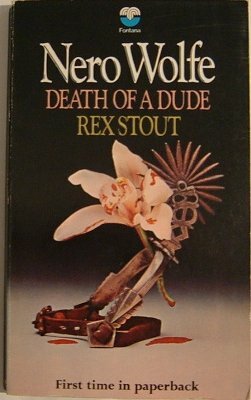 So there isn’t a misplaced piece of harness or an unauthentic Western Vista in this, one of the funniest, most engaging, and most out-of-doors of all Nero Wolfe adventures. 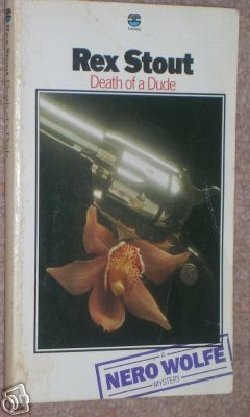 This Collins Crime Club, 1970 Edition, British cover came to us (with 2 others!) from Tina Silber AKA peephole. This 1972 Fontana British cover came to us (with 2 others!) from Tina Silber AKA peephole. This 1976 Fontana British cover came to us (with 2 others!) from Tina Silber AKA peephole. 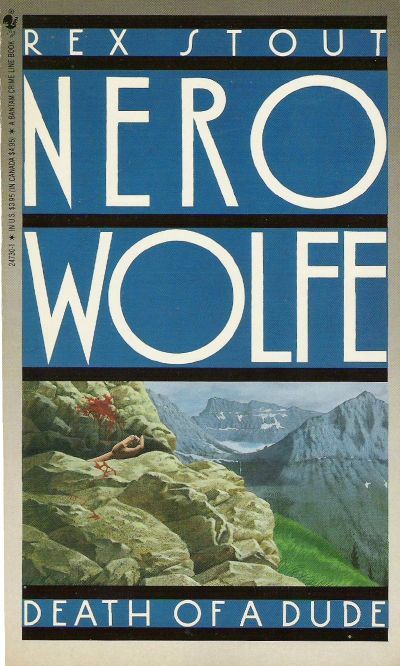 Although I’ve never been to the US, much less Montana, whenever someone says “Montana” I always think back to the cover picture for this Wolfe novel (sans bloody arm, of course). 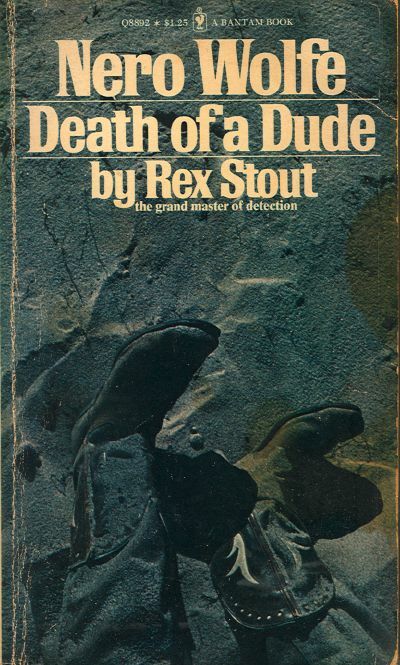 Cover artwork – copyright 1989 – Rick Lovell. 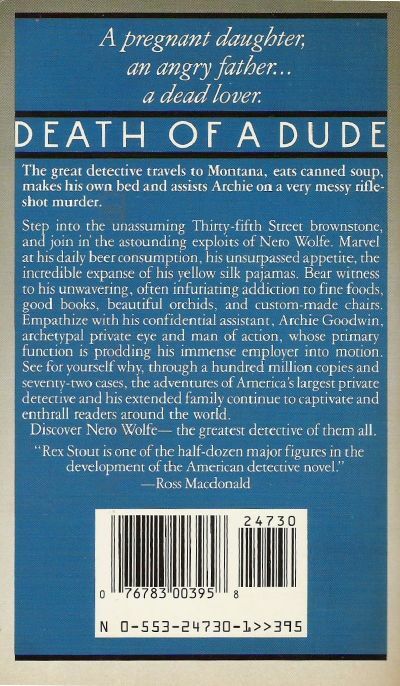 The great detective travels to Montana, eats canned soup, makes his own bed and assists Archie on a very messy rifle-shot murder. Step into the unassuming Thirty-fifth Street brownstone, and join the astounding exploits of Nero Wolfe. Marvel at his daily beer consumption, his unsurpassed appetite, the incredible expanse of his yellow silk pajamas. Bear witness to his unwavering, often infuriating addition to fine foods, good books, beautiful orchids, and custom-made chairs. Empathize with his confidential assistant, Archie Goodwin, archetypal private eye and man of action, whose primary function is prodding his immense employer into motion. See for yourself why, through a hundred million copies and seventy-two cases, the adventures of America’s largest private detective and his extended family continue to captivate and enthrall readers around the world. 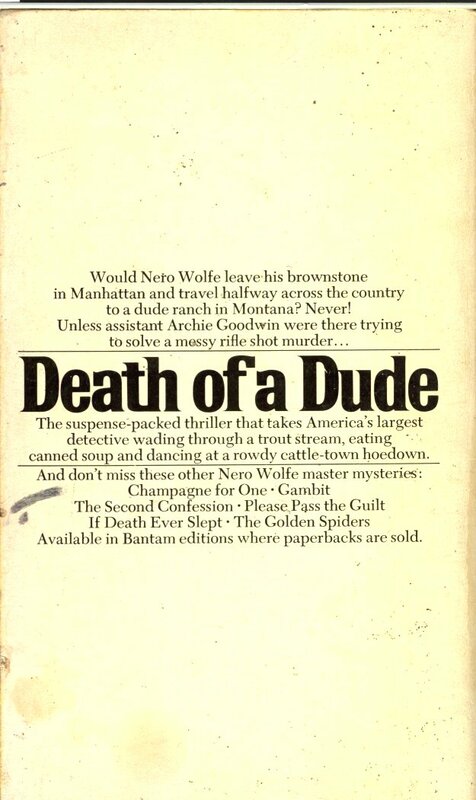 Discover Nero Wolfe — the greatest detective of them all.